On Monday 23rd March we will be holding our next Northampton Inspire Network Meeting. This will take place in the Sulgrave building – go to reception and you will be directed from there. it will start at 4.30pm although refreshments will be available from 4pm. We will be creating immersive sensory experiences around a theme. 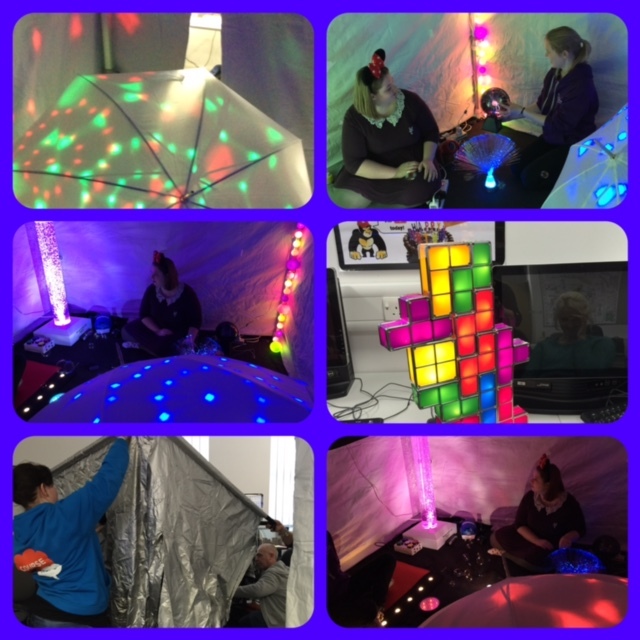 This session explores cheap and effective ways of creating multi sensory environments for visual and sound stimulation using portable dark and white rooms. We will experiment with a wealth of light and sound equipment, create images using luminous paint, and project sensory iPad apps and video onto 3D objects. 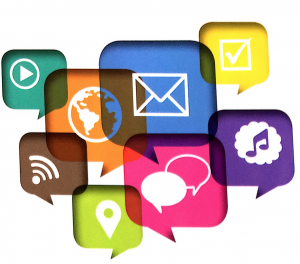 The aim is to create controllable experiential activities that encourage engagement and interaction for all learners, and to think about creative ways of theming these. We have been inspired by the work of Richard Hirstwood: http://youtu.be/ihMSw8BIXF4 and http://youtu.be/PkIKpOn7y98. You can book free tickets here and feel free to let others know about the meeting – it is for students. teachers, teaching assistants and other interested people. 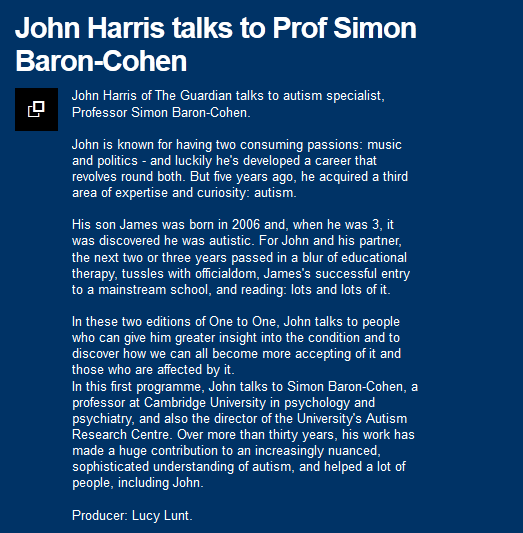 Over the last few weeks on the One to One programme on BBC Radio 4 John Harris, a journalist on The Guardian, has been talking about autism. His son is autistic, in these two programmes he talks with an expert on autism (Professor Simon Baron-Cohen) and an adult who was diagnosed as autistic in her thirties (Penny Andrews). In the first programme John Harris talks with Professor Simon Baron-Cohen. In this conversation the development of understanding about what autism is is discussed. Its interesting that he talks about discovering people with autism who could talk about the experience, something that at the time was new as it was assumed that people with autism would not be able to function in day to day life. In the conversation John Harris discusses how difficult it is for him to conceive of how his son understands the world. Simon Baron-Cohen suggests that we do inhabit the same world in some respects and that we do have things in common. He uses the example of structure, repetition and routine where he comments that many people with autism need but so so many other people, something John Harris agrees with. Simon Baron-Cohen discusses the concept of neuro diversity – there are different types of brains in the population rather than a single ‘normal’ brain, similar to the concept of biodiversity, that we encounter in the classroom. He talks about how some of the traits or qualities of autism can be seen as areas of strength – remarkable attention to detail, fascination with patterns and an ability to persist and go deeply in one topic. 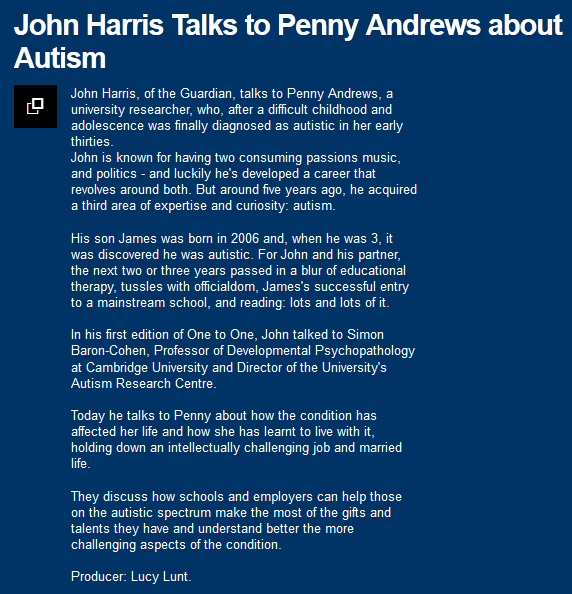 In the second programme John Harris meets an adult who has been identified as autism in adulthood and who works as a university researcher – Penny Andrews. This is an interesting conversation – John Harris picks up on some of the points made by Simon Baron-Cohen and that he has notices in his own experience with his son. He is keen to have her perspective as his son is to young to be able to articulate and explain his feelings and needs. Towards the end of the conversation they talk about how Penny’s employer is able to adjust and support her so that she can work effectively. It is also interesting how Penny explores the connections between herself and people who are not autistic and people who are considered to be severely autistic. For many of you who work with children on the autistic spectrum both these programmes are of interest, giving you some background and perspective on autism historically, theoretically and personally. From a student point of view it is interesting for you to notice how John Harris compares the research of Simon Baron-Cohen with experience of Penny Andrews – we often ask you to make these connections between research and practice in your academic work. Both programmes are available on iplayer here They were broadcast on 17th and 24th February 2015 and can be found in the episodes list. They are also saved in Box of Broadcasts if you are a university student. If you listen to these programmes and have any comments please add them below. Come along to an evening of sharing teaching and learning ideas. We’ll have mini presentations on creative classroom activities across the curriculum and there will be lots of ideas you can start using straight away. 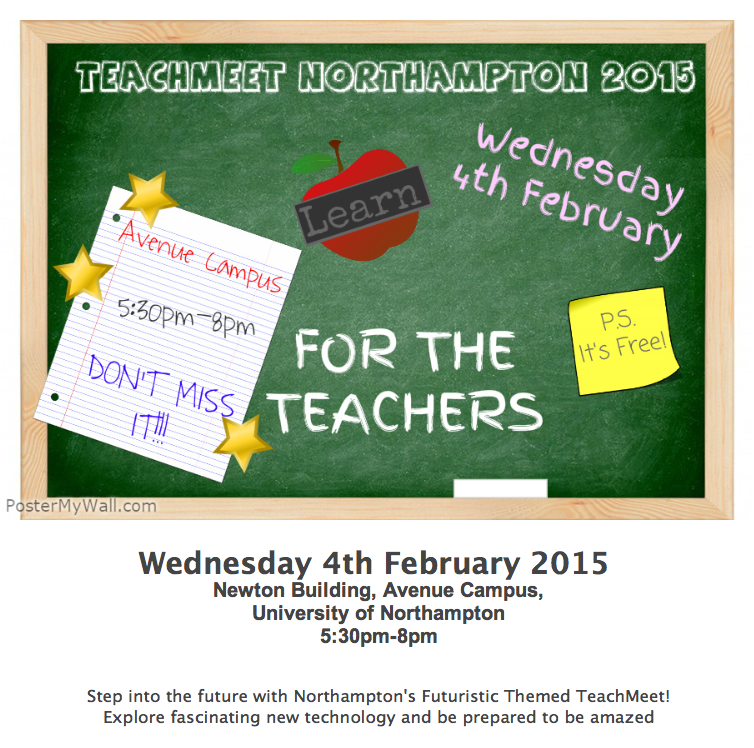 Everyone is welcome to join in: teachers from all types of schools, teaching all subjects and age groups. 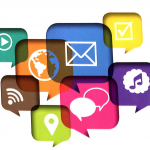 The main part of TeachMeet is hearing stories about any aspect of learning from teachers. 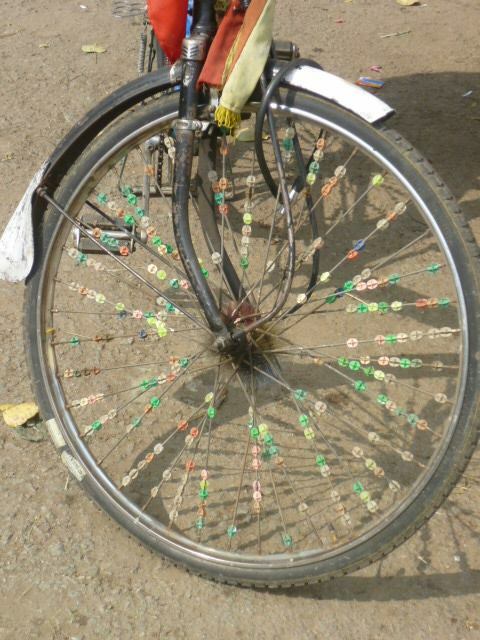 It is a chance for teachers to meet to hear ideas from each other and be inspired by colleagues. Presentations can be on absolutely anything that you’d like to share from practice: the futuristic theme simply refers to the way our Events Management students are helping to style the venue. We are delighted to welcome Sally Hamson, Head of Wollaston Community Primary School to help host our TeachMeet. We’ll also have refreshments and some exciting technologies to explore such as Oculus Rifts, Robotiky robots, Raspberry Pi add-on kits and green screening demos. Rebecca Heaton and Jean Edwards will be drawing some visual minutes for us to document the presentations. You can sign up for a free ticket by clicking the link to the right of this post. PLEASE NOTE this event is in the Newton great Hall at Avenue Campus – there is a map on the wiki. The next meeting of the Book Group will be on Monday 26th January at 17.30 in S036. 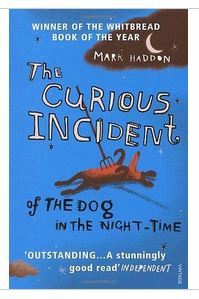 The book to be discussed will be ‘Curious Incident of the Dog in the Nightime’ by Mark Haddon. Please also follow on Twitter – @BookGroupUoN and look out for the live Twitter feed from 18.30. You may be interested to know that the National Theatre production of this book is coming the Royal and Derngate in Northampton from the 24th to the 29th March. I have seen this and I do recommend it. You can find out more about it at this link. You might have noticed some headlines in the media last week about the use of ‘lavish praise’ in learning and teaching. 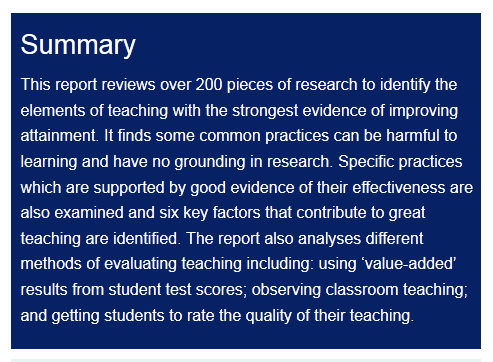 You can read the main findings and download the entire report here – What makes great teaching? Hello! I’m Lisa Shepherd and I am one of the tutors on the FDLT course. I will be working with year 2 groups in Oadby and at the University on completing the small scale school based research projects. I have already met with both of the groups and heard some of their great ideas and am very much looking forward to supporting them on their research journeys. I also teach on the SEN and Inclusion course and am very pleased to be a BALT dissertation supervisor for the first time this year. It is such a privilege to support students completing their important and inspiring research projects in education. 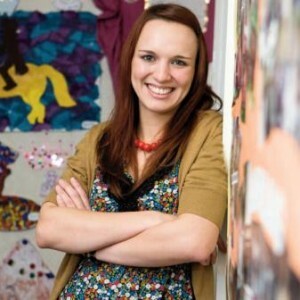 I am a Creative Practitioner and Dramatherapist who works with children, young people and adults in a variety of educational and community settings. I devise and deliver projects in schools and specialised educational settings, day centres and residential homes, prisons, libraries, community organisations and charities. I enjoy the process of research and write up my own work regularly. I was very pleased to get my article on the use of comedy as a creative vehicle for expression with young people for whom English is an additional language published in the Support for Learning Journal recently. My passion is theatre, drama and the creative arts and I enjoy writing for performance, directing, puppeteering and on occasion performing myself without a puppet friend to hide behind! I also enjoy travelling and have worked with children and young people with SEN in the USA and Romania. In my spare time I enjoy making just about anything…sewing clothes and furnishings, up-cycling furniture, making puppets and puppet films and making a variety of strange props for performances by local youth theatre and amateur dramatics groups. You can follow me on twitter @TheatreTherapy and Facebook https://www.facebook.com/pages/Imaginary-Ordinary/403267633048038 where I post about what I am up to and all things creatively and socially minded which interest me. Tomorrow (Wednesday April 2nd) is the seventh annual World Autism Awareness Day. You can read more about it here. This evening there is a Horizon programme on BBC at 9pm. It is repeated on Wednesday 2nd April on BBC 2 at 11.30pm and will also be available via the BBC iplayer and Box of Broadcasts. Professor Uta Frith was also interviewed on Radio 4’s ‘The Life Scientific’ a few years ago, a very interesting interview where she discusses her interest in Autism and her life as a psychologist. You can listen to it at this link and via Box of Broadcasts. You can watch a video of the UN panel discussion here. 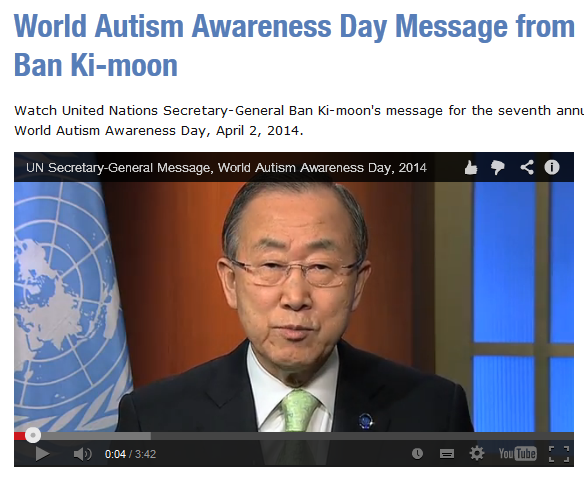 You can watch the UN Secretary General’s message here. Richard Rose, Professor of Inclusive Education and Director of the Centre for Education and Research (CESNER) at the University of Northampton, has begun writing a blog. At present he is teaching in Bangalore in India. He arrived only a few days ago and his post from today discusses working with teachers to create a format for Individual Education Plans, principles for implementation and a process for evaluation. Yesterday he shared with us the RTE – Right to Education Act – and the implications for schools and education.